When George England's rendition of the "Warbonnet 250" was originally published in his "Nostalgia" column, the War Bonnet 250 was the only Trans Am in Oklahoma. John Hansford from NEOKLA has provided excellent photos of the event, and he dug them up after all these years when he discovered this website. A big THANK YOU to John. Also added below is the race story and complete race results from the July issue of Sports Car. 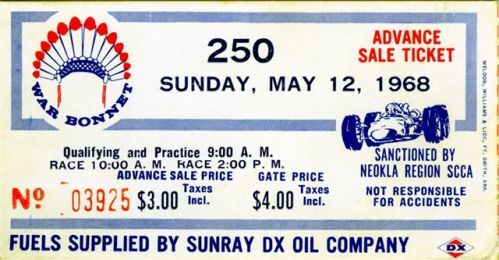 It was twenty years ago the eleventh of May, 1968, that the first and only Trans-Am race ever run in Oklahoma took place. It was one of the all-time great races I’ve ever had the pleasure of being involved with in my thirty years in the sport. Held at the then new War Bonnet Raceway at New Mannford (Hallett’s forerunner), the Trans-Am attracted some mighty potent competitors who put on a never-to-be-forgotten show of driving skills. The late, great Mark Donahue was there with the Penske Camaro. The AMC Javelin team with the late Peter Revson and George Follmer driving was present and Parneili Jones and the late Jerry Titus represented the Ford Motor Co. in Mustangs. Malcom Starr had a privately sponsored Mustang and our MIDIV’s own John McComb entered his prior year’s National Championship Mustang. My B Sedan Volvo, 6th at the run-offs at Daytona in ‘67, was eligible for the Trans-Am but I wisely chose to work the event rather than enter, and returned to my first love, corner working. The England family manned Corner Station # 6 where I was privileged to see for the first time, real pros in action at close range. Donahue won that race, running for three hours like he was on rails. He was so consistent and smooth he looked slow, but he lapped all but three of his competitors. Parnelli was the most spectacular, dirt- tracking it all the way and he actually passed Donahue three times at our corner but couldn’t hold the lead, and wore out his tires early. Revson and Follmer made the Javelins look good and swapped positions frequently all afternoon, finished 2nd and 3rd. Malcom Starr provided the ultimate excitement late in the race by running through two fences and into the crowd at Turn # 10. No one was injured but the race was red flagged in the resulting confusion. It was an unforgettable day of racing - one never since equaled in our state. I had a lot of track time at Warbonnet, but when I saw for the first time what true professional drivers could do, I was glad I had not entered. I would have been embarrassed. Editor's Comment: The England family actually worked two corners at the Trans-Am; Mike Dickey and I worked Corner # 3. From there I observed Pete Revson being the fastest of anyone going through Turn # 2 and up the steep hill through our station. I mimicked his technique in my bugeye later in 1968 and GAINED TWO SECONDS a lap, since the straight from Turn # 3 to the hairpin at Turn #5 was the longest on the track. With only 38 horse power at the rear wheels, my bugeye needed all the help it could get going up that hill. Also, the race party Saturday night was really cool as we plebian workers got to mingle with the drivers. Team Penske was a no show, but Revson and Follmer were real party animals. Parnelli drove one of the infamous "Tunnel Port" Mustangs, the most powerful engine on the Trans-Am that, or possibly any year. The intake ports were so large that the intake valves actually ran through the ports. Ford dropped the engine because the lack of low-end torque created more problems than the excess of high-end horespower solved: hence Parnellis "dirt-tracking" to keep the revs up wore out his tires. A spectacular driving exhibition non-the-less. Mark Donohue. 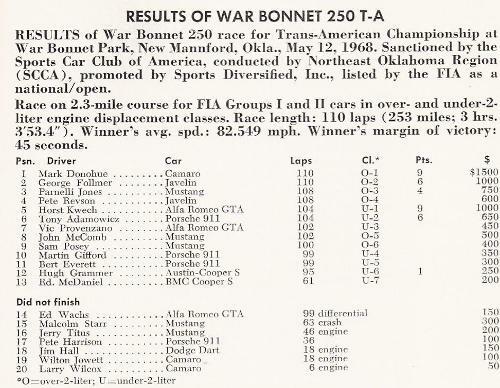 Media, Pa. continued his early season dominance of major road races by winning the War Bonnet 250, at New Mannforcd, Okla., May 12, a race in SCCA’s Trans-American Championship for sports sedan manufacturers. 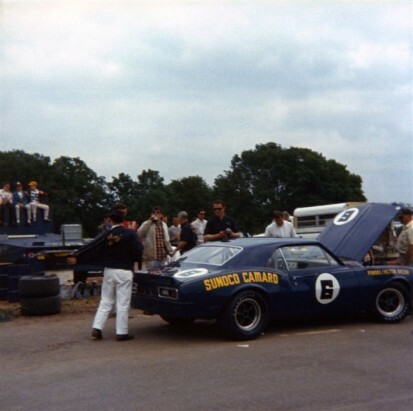 Donohue, driving a Camaro, gained 9 points for Chevrolet to stretch their lead in the championship to 7 points over Ford, 24 points to 17. Donohue won at 82.549 mph in the three-hour race. He had a 45 second margin over George Follmer driving a Javelin at the finish. The six points Follmer won for American Motors gave them a total of 8 in the championship. Horst Kwech, Lake Forest. Ill., took the under—2—liter class victory winning 9 points for Alfa Romeo He had a race-long battle with Tony Adamowicz (Porsche 911 who finished second. The race was temporarily halted when Malcolm Starr’s Mustang went off course and into a fence. Two spectators suffered injuries, the most serious being a broken arm. Donohue, Follmer, Parnelli Jones (Mustang), Peter Revson ( Javelin) and Jerry Titus ( Mustang) had a series of battles for the leading spots that kept the crowd of 15.000 on its feet. Jones was forced to make an early, unscheduled pit stop that dropped him two laps, he was never able to make up on the leaders. But he passed everyone else in a long chase that won third place just ahead of Revson.